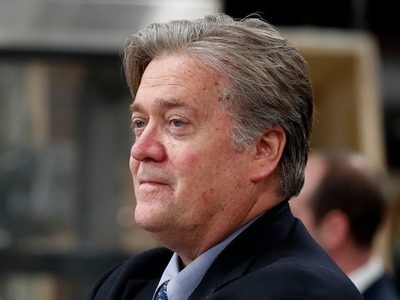 Prior to his departure from the White House, former chief strategist Steve Bannon reportedly met with Robert Mercer, the billionaire mega-donor who backs President Donald Trump, at Mercer’s Long Island estate on Wednesday. The two discussed what comes next in terms of political and media strategy, according to Axios. Mercer, who is co-CEO of Renaissance Technologies, then met with Trump and a small group of donors the next night in Bedminster. The Mercer family has garnered plenty of media attention recently for the millions they poured into the Trump campaign through the Make America Number 1 political action committee, which was run by Mercer’s daughter Rebekah. The Mercers also donate heavily to Breitbart News, where Bannon served as executive chairman before joining the White House. Robert Mercer’s unconventional views have raised eyebrows and earned him a reputation as a conspiracy theorist. Mercer reportedly believes the Clintons have had opponents murdered, that nuclear radiation from the atomic bombs dropped on Hiroshima and Nagasaki made Japanese citizens healthier, and that African Americans were better off before the Civil Rights Movement, according to an extensive profile published in The New Yorker earlier this year. Bannon and Mercer share nearly identical political opinions on the evils of big government — both have reportedly expressed the desire to see the US government destroyed. Their ongoing relationship and growing influence will almost certainly continue to impact the White House. Mercer was behind some of Trump’s most prominent appointments, including Kellyanne Conway as counselor to the president and Bannon as chief strategist. Bannon’s swift exit came just three weeks after Trump named retired Gen. John Kelly as chief of staff, but many speculate that his firing had been in the making for weeks.